The Tijuana Country Club has the city's only golf course. 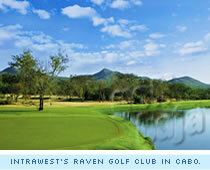 Bajamar scores high for its strikingly beautiful landscape and casual, slow-play atmosphere. This normally quiet course is in the first stages of a major overhaul. Learn more about the Baja's undisputed premier Pacific paradise. Cabo San Lucas' Raven has earned its elite status. In 2001, the golf course at the Cabo San Lucas Golf and Country Club was severely damaged by Hurricane Juliet. It was originally designed by Pete Dye and opened in 1994, but just 7 years later it was hit by 4 days of severe wind and rain which left its future up in the air. Intrawest Corporation, one of North America’s premier resort development companies, turned its interests to Mexico for the first time, and sent its Golf Group to Cabo San Lucas to elevate the former Country Club course into a championship layout with unparalleled resort services. $5,000,000 later, the completely overhauled Cabo San Lucas Country Club was born. The Cabo San Lucas Country Club offers the area’s only golf course view of the magnificent and oft-photographed Land’s End, the gigantic rock formations on the most southern tip of the Baja Peninsula that mark the meeting point of the Sea of Cortez with the Pacific Ocean. From the moment one enters the lavish gateway of the property and passes by the ornate fountains that grace its entrance, it is hard to deny that you have just stepped into paradise. The 745-acre resort community overlooks the Sea of Cortez, and the golf course is built in an area of beautiful desert terrain with a delicate ecosystem that is protected for the many native species of plants and animals. Despite rebuilding holes 10 through 15 from scratch, the same basic layout and character of the earlier Dye-designed golf course has been maintained. They respected the original flow and avoided giving course a “cut up” feel. The playing areas were designed to merge with the existing terrain so the greens seem to naturally move into the arid landscape. The hole that stands out the most is #5. As the highest handicapped hole, it plays 446 yards from the championship tees. The long fairway shifts dramatically to the right and leans slightly uphill. The green has sand bunkers near the front, on both the right and the left, and a sparkling lake at the back left. Don’t be fooled by the gentle sloping of the fairways, as this course has 300 feet of elevation changes! The Clubhouse has a pro shop, tennis courts, and a fine dining establishment. 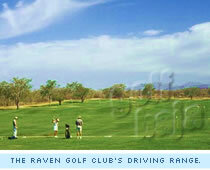 No other golf course is as close to the heart of Cabo San Lucas as is the Cabo San Lucas Country Club. This gated community has the presence of a private club but is open to the public. Guests of the Cabo San Lucas Country Club can expect to be treated with the highest standards in service, and will have an unforgettable Baja golfing experience.